Meetup.com is an excellent website service to help you find virtually any interest group near your country, locality or city. and guess what, now its super easy to search and know where those illusive and stealth Divine lovers gather and sing together. Surprise, surprise! they are nearer than you know. [>] visit sufism.meetup.com to find and to meet local people interested in Sufism, the mystical tradition of Islam. The website is pretty neat with very useful features such as calendar to know exactly the events according to dates. For example: calendar for Los Angeles Beloved Sufis shows you all the events according to date. Different cities may have different sufi paths (tariqa) gathering, but hey! when it comes to Divine lovers, who cares the differences? Don't forget to signup for free to become member. [>] click here to browse the cities or countries for Sufi meetup. May God connect your heart with blessed souls in this path of truth. 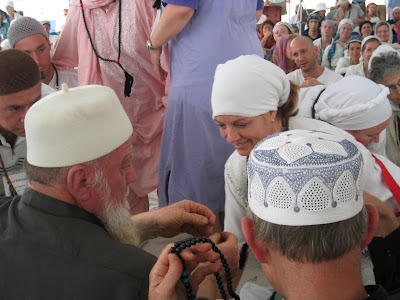 image credit: Sufi Master Sidi gives prayer beads to a new beloved after bayat / initiation to sufi path.